The weather was just beautiful today. It was in the mid 90's, which is the hottest it has been this year. It was a welcome surprise! This morning, we took the kids for a long walk. One thing we definitely received confirmation of is how incredibly fair skinned Nika is. It didn't even occur to me to slather on some sunscreen at 9 in the morning, however we clearly should have. Poor little miss got a little burnt just from riding in the bike trailer. I got a little burnt too on my shoulders, but hey ... I could use a little color. Ha. 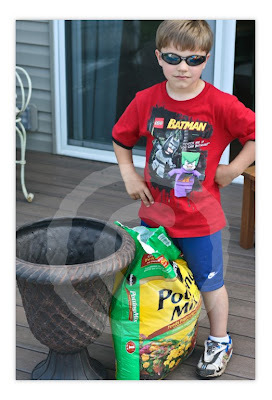 Mason has been asking to plant flowers. I guess the warm weather over the past week or two has gotten him in the mood. So after our walk today, I took him to the garden center to pick out some flowers and a pot. Holy crap ... who knew planters were so expensive?! Seriously! I also ended up buying two ferns, but when I found them for $20 cheaper per plant later on in the day, I sent Kyle to return the first set. Ha ... hey, that is $40! 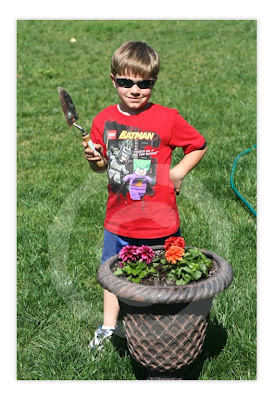 Mason getting ready to plant his flowers ... he was totally annoyed at me for wanting to take a picture ... LOL. 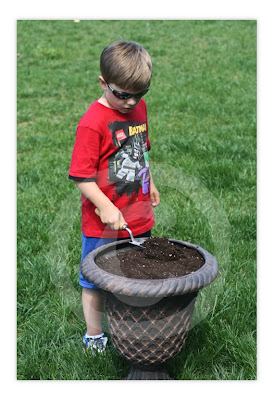 Mom, pour the soil already! Ta da! Beautiful flowers, bub! The girls have been getting along so great. It is so fun to watch them together ... best friends forever. Payton has definitely taken advantage of her big sister role ... in two ways. She is constantly looking out for Nika. For example, she will throw a fit if I give her pretzels, but not Nika. Said fit will continue until Nika gets her pretzels ... even if Nika was eating something else. I guess everything they do has to be the same? Sigh. Payton also has learned how to be a little bossy girl ... she pretty much thinks she is in charge of Nika. It is pretty funny, actually. Typical big sister ... right sis? 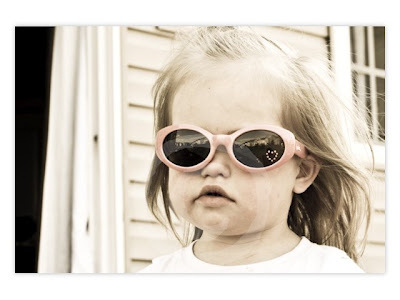 Little sis ... looking cute in her crooked sunglasses ... you think she has ever worn sunglasses before? 90's sounds so wonderful..no sun here today..just rain and thunderstorms ALL day. 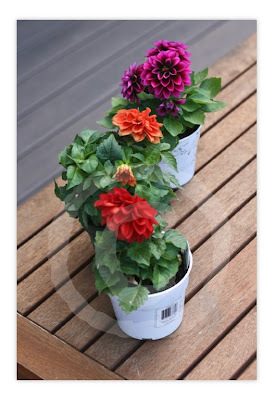 Mason will love to watch his flowers grow this summer (don't forget to water them like we do!). Jack and Grace love to plant flowers with me but they aren't too happy when I let them wilt and burn in the sun :). Payton and Nika are adorable together..they look like they are sharing secrets in the picture together. Too cute! P is telling N how to push the on-star button! hee hee! Cute pics, as usual. Alexander and Mark have planted seeds as well. Must be in the air. 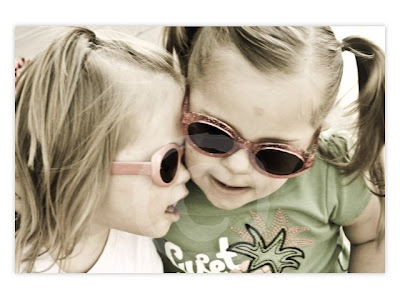 Love the photos - but the one that I absolutely adore is the one with both girls in their sunglasses. It should be on the cover of a magazine! 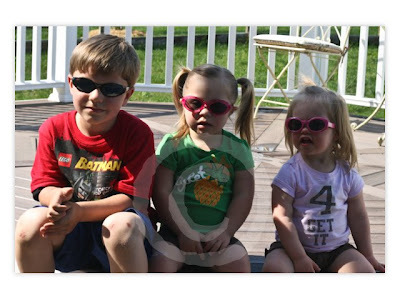 The kids look so great in their shades, lol! I'm so glad warm weather is finally here..maybe. Such beautiful photos! I love all of the sunglasses! I LOVE the picture of the girls! So beautiful! Lovin' the summertime pics(even though it's only April-lol)! The BFF pic is so beautiful! How cool is it to look at that and think that 7 months ago, Nika didn't know her life was giong to change in such an incredible way? 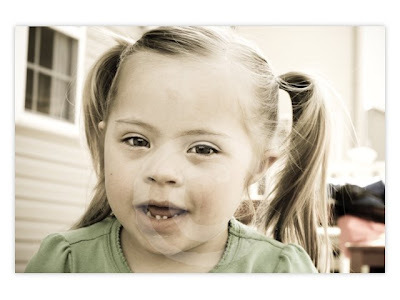 oh i love your kids, they look so cute! Um, I am not sure about the bossy big sister rule. Poor Nika, I feel your pain girl! 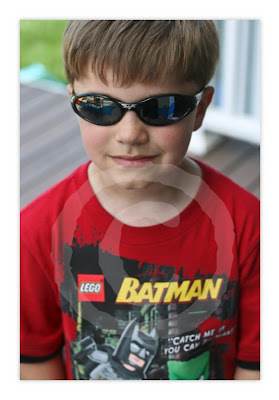 I found your blog off Dylan's and wanted to let you know how adorable your kids are. The OnStar story is so funny.